Human evolution can be divided into two distinct phases: (1) in the first, human evolution depends on the DNA-gene information based on direct and predictable processes, and (2) in the second, human evolution depends on the neuronal networks which generate complex and non-predictable effects. In the first phase, the information necessary for the generation of the neuronal cells depends on the DNA-gene information, while the second phase is connected with the formation of complex neuronal networks which is largely independent from DNA-gene information. 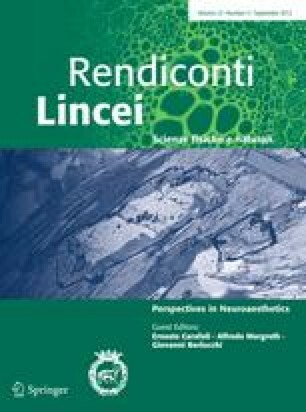 This contribution is the written, peer-reviewed version of a paper presented at the Golgi Symposium on Perspectives in Neuroaesthetics, held at the Accademia Nazionale dei Lincei in Rome on June 13, 2011. 1 To what extent does the human mind–brain system contributes to physiological functions and evolution? In human evolution, the mind contributes to the development of several fundamental properties: (a) the functions involved in communication such as language, vision and many others, (b) the products responsible of the generation of culture, science, morality, technology, art and others, (c) the generation of intentionality which is essential for the activation and the regulation of the human behaviours, and (d) the generation of one of the most fundamental mind function, namely that of the free-will. The evolution of the human brain is characterized by the development of a gigantic number of synaptic connections between neurons endowed with two types of prolongations, namely axons and dendrites. The operation of a neuronal network is dependent upon: (a) the length of the axons and dendrites, and (b) the billions and billions of synaptic inter-neuronal connections (say about 10,000 connections for each prolongation, up to a total number higher than 1014 total connections). New properties are generated by the neuronal networks by procedures that are unique in each human mind. One example is that of human language, emerged 80,000–100,000 years ago, possibly because of mutations in the Broca’s area in the frontal cerebral cortex, and which is essential for the full activity of the human brain. Intentionality and language are essential tools by which the mind–brain system regulates the behaviours of human beings and their relationships with the outer world. Another fundamental function of the mind–brain system is that of introducing free-will in human behaviours. Free-will behaviours require: (a) the presence of a large variety of multiple connections between the gaps of the neuronal networks, and (b) the use of intentionality to perform multiple selections. At variance with non-human species, the evolutionary development of the members of the human species occurs by means of two different mechanisms: (a) the first mechanism, lasting between 9 and 18 months, is that which utilizes the information provided by the DNA-gene system, (b) the second mechanism is determined by the development of the human personality. In this second mechanism, two new types of operations are developed: first, the developments of language and intentionality, and second, the generation of free-will and voluntary behaviours. These operations lead to the development of culture, science, technology, art and morality. 2 Do the mutation–selection mechanisms provide a satisfactory explanation of the human evolution? In the biological world, the concept of evolution is linked to the name of Darwin; the discovery of the DNA’s role in the transmission of information in the new generation has consolidated the Darwinian conception. It has become, then, generally accepted that evolutionary processes, based on the information generated by a mechanism of mutation–selection and transmitted by DNA and genes, are capable of explaining all the evolutionary changes that have occurred in the past, and will continue to occur in the future, in both non-human and human species. Some years ago, a great French scientist Monod (1970), suggested that all evolutionary processes, including those of the human species, operate by means of a mechanism defined as of chance and necessity. The question then arises as to whether the mechanism of chance and necessity can provide a complete and satisfactory explanation of human evolution. In major dictionaries, for example, evolution has also been defined as follows: a gradual and complete development or act; the slow and gradual transition of inferior and rudimentary organisms to more complex forms. Why there are such wide differences in the description of the evolutionary human processes: from where and how do these differences arise? I shall now defend the thesis that whereas the definition of the evolutionary processes, as determined by the mechanisms of mutation and natural selection, may be accepted without objection when dealing with the evolutions of non-human species, this is not the case when the problem is that of explaining human evolution. In my view, the definition of evolutionary processes only as products of a Darwinian type of evolution, based on information provided directly by, or generated indirectly through, the DNA-gene system is too limited. The term Darwinian evolution is not sufficient to explain the generation of the wide information necessary for the full development of the human species (see Searle 1992, 1997, 2001, 2002, 2004). My conclusion (Azzone 2002, 2003, 2008, 2009, 2010a, b, c) is that human evolution cannot be explained only on the basis of the processes depending on the DNA-gene information (cf. Crick 1994; Churchland 1998; Chalmers 2002; Slimansky 2002; Wegner 2003; Richerson and Boyd 2006; Ayala 2009). My view is that: (a) evolutionary processes operating in the human world are not dependent only on the DNA-gene dependent information, and (b) human beings are equipped also with other very complex, additional, mechanisms which play an important role in human evolution. I shall, then, discuss the evidence in favour of the views that: (a) in the human world there is a much more complex evolution, which is also of a different nature with respect to evolution in the non-human world, and (b) the neuronal networks, operating within the human brain, generate new types of evolution based on purposeful behaviour and language. The most important difference between human and non-human evolutions is that while both human and non-human organisms are subject to DNA-gene dependent processes, the human world is also open to the much more extensive influence of purposeful processes produced by complex neuronal networks. The profound difference is that human biological processes are also dependent on the products of neuronal networks and on intentional information. My view, therefore, is that in human evolution the mind–brain system determines processes of adaptation, self-organization and creativity, which are, to a large extent, independent from the contribution of the DNA-gene system. Which are, then, the two most significant differences between the evolutions of the non-human and the human worlds? First, while in the evolution of non-human species the effects produced by intentions (purposeful behaviour) are almost negligible, in human evolution the effects generated by the complex neuronal networks and caused by intentions are of primary importance. Second, the DNA-gene dependent non-human evolution involves events and behaviours which are mostly homogenous and predictable, whereas intentionality-dependent human evolution involves events and behaviours which are mostly non-homogenous and non-predictable. Several years ago, Dawkins (1976, 1986) proposed the term meme to indicate the concept of “units of the neural-cultural transmission across generations” within the general scheme of Darwin evolution. For Dawkins, examples of memes are: the contents of scientific theories, ideologies, literature, arts, religions, human rights, tolerance, and so on. In Dawkins’ analysis, the memes should be considered as similar to the genes being carriers of immortal essential properties for the continuity of their cultural contents. A somewhat similar proposal had been advanced, almost simultaneously, by Cavalli Sforza and Feldman (1981), who have used the expression “cultural character” to indicate a unit of cultural evolution and reproduction. More recently, an adaptation of Darwin’s concept to religion has been described by Ayala (2009). The neuronal networks, introduced in the present paper, operate as the memes of Dawkins and the unit of cultural character of Cavalli-Sforza and Feldman. The replacement of the terms memes and cultural character with that of neuronal networks is based on two considerations. The first is that in the absence of biological references memes and cultural character appear as a sort of metaphysical entities. On the contrary, the concept of neuronal networks indicates the well-defined role of a large set of components of the human brain–mind. The second consideration is that, during the whole life, the operation of the neuronal networks is accessible to analysis by the neuroimaging technique based on functional magnetic resonance and other modern techniques for brain analysis. When and how did human beings acquire, by means of neuronal networks, the capacity to promote a completely new evolution with respect to the evolution solely based on the DNA-gene system? Although the information necessary for the generation of each neuronal cell is always provided by the DNA-gene system, when, why and how has the information generated by neuronal networks become almost completely independent from that generated by the DNA-gene system? I shall now discuss two different aspects of these problems in order to explain: (a) the differences between the two worlds, human and non human, and (2) why, in human beings, the information provided by the mind structures is so deeply different from the information provided by the DNA-gene systems. First, it should be remembered that neuronal cells with their axons and dendrites are not static but active entities, in that their synaptic interconnections can change continuously, thus establishing novel combinations within the neuronal networks of the mind–brain structure. The second problem is that the functions of the mind–brain system are partly dependent on the initial neuronal interconnections determined by the genes, but much more on the very complex neuronal networks generated by everyday life experiences. The activity of the mind–brain system is dependent upon the continuous development of neuronal synaptic interconnections, with each neuron being connected on average with 10,000 other neurons, so that the total number of connections probably exceeds 1014. It should also be remembered that each inter-neuronal synaptic connection can be preserved or discarded depending on whether the connection is useful or useless, i.e. depending on the use made of each connection during the activities of the whole mind–brain system. Although the exact number of neurons and synapses present in various species (human and non-human) is not yet known, it is probable that this number differs greatly between the various animal species as well as between individuals of the human species. In conclusion: (a) the number of neuronal networks in the various species is still unknown, and (b) most of the information present in the neuronal networks, so important for the evolution of each human being, has not been transmitted by the DNA-gene system, but has been generated during the human life. Among the most important events within the evolutionary history of the human brain are the mutations of the Broca’s area which have generated the human language. The appearance of vocal language, which probably occurred 100,000 years ago, has forced human beings to abandon almost completely the communication by gestures. The generation of language has then become one of the most important differences between humans and other animals. The new information generated in the Broca area, however, is not sufficient for the complete acquisition of language. Much evidence has now been obtained in favour of the view that: (a) the potentiality to develop language is not sufficient to learn the language, and (b) a linguistic environment is required in order to provide a suitable education for learning a language. Language acquisition is dependent on the properties of the social environment (Chomsky 1975; Edelman 1987, 1993). The functions of Broca’s area are, then, also an essential, although incomplete, tool for the generation of intentionality. Following previous suggestions by Wittgenstein, many philosophers of mind, in particular Searle (1984, 1992, 1997, 2001, 2002, 2004) have concentrated, in the last 20 years, their attention on the fact that the products of the mind activities tend to direct not only human but also non-human behaviours towards the satisfaction of their intentions. The intentions of human beings have, on the basis of Searle’s conclusions, become fundamental biological properties which tend to direct the human behaviours towards objects or things. A further conclusion is that intentions aim to favour the actions and the satisfactions of all living organisms. As pointed out by Searle, the mechanisms of intentionality render the mind–brain system a biological entity which: (a) is additive to, and independent from, that created by the DNA–gene system, (b) renders the mental processes responsible of the properties of free-will as well as of voluntary behaviours, and (c) is responsible for the most important properties and behaviours such as those of culture, science, morality and art. Briefly, the capacity of the neuronal networks of generating intentional behaviours—on the basis of an information completely independent from that produced by the DNA-gene system—provide the generation of new and additional evolutionary processes to the human world. These new processes—due to the complex capacities of the products of the neuronal networks associated with the use of language—determine a completely novel and different evolution with respect to that dependent only on the DNA-gene system. This new intentionality–language promoted evolution operates at much more rapid rates and at much more global levels as compared with the evolution dependent on the effects of the DNA-gene information. Since human behaviours of intentional nature appeared only in the last 80,000–100,000 years, human beings have been capable—before the appearance of language—of expressing their intentions in non-linguistic ways. Probably, human beings not in possession of language, but willing to transmit their intentions to others, used simple gestures and body languages. After a long and gradual evolution, the development of intentional behaviours began to occur first in primates and then, about 3 million years later, in human beings. Human beings had, however, to wait three further million years to achieve the capacity of using language and then of associating intentions with language. Although other primates were able to develop beliefs, desires, and other forms of intentionality in very primitive forms, only human beings have then been able to achieve the fantastic results provided by the association of language with intentions. The language–intention association has therefore played a fundamental and unique role in the complex events which have accompanied the beginning of the development of modern humans 100,000 years ago. The concept of intentionality indicates the great variety of mental attitudes directed towards either events or the living states dependent on mind activities: beliefs, fears, hopes, desires, love, hate, joy, pride, shame, etc. The term intentionality comprises, therefore, the ensemble of properties that, during the interactions with the outside world, renders thoughts, feelings and mental attitudes directed towards entities or events occurring either in the outside world or within the mental world. According to the language of philosophers, beliefs, fears, hopes, desires etc. are always expressions of the intentionality of human beings (see Searle). In short, the intentionality of the human beings is the special tool by which the mind regulates the relationships between properties which either remain personal or lead to contacts with the outer world. Searle has also suggested that in human behaviours, a novel fundamental correlation emerges between intentionality and speech acts. In Searle’s view, the intentional states of the human beings, inasmuch as they are manifestations of the states of mind, can be considered equivalent to the interpretations of speech acts (linguistic expressions). The consequence is that the intentional states—whose contents, conditions of satisfaction and directions of adaptation are similar to those of speech acts—have functionalities also similar to those of speech acts. In Searle’s view, however, it is the language that derives its functionality from intentionality, and not vice versa. This suggestion is in accord with the fact that the information provided by the logical analysis of human language explains the mind intentions (which is the information provided by the content of the language). The nature of intentionality may, then, be seen as nothing else but the expression of the conditions which are required to realize the satisfaction of human desires. Intentional states, desires and beliefs have always conditions of satisfaction and directions of adaptation. The beliefs of human beings are true or false depending on whether their contents adapt or do not adapt to the external reality. This means that human beliefs have a direction of adaptation of the type mind-to-the world. On the other hand, the desires may be considered as satisfied depending on whether the content of the desires of the mind is fulfilled or frustrated by the world. Therefore, the desires of human beings are satisfied if fulfilled and not satisfied if not fulfilled: in this case, then, the satisfaction is of the type world-to-the mind. The concept is very popular that the biological operations used by the mind to generate consciousness and its products are not physical in nature. My opinion, in contrast with this conviction, is that if the mind processes, responsible for all consciousness phenomena, would not be physical in nature they would never have effects on behaviour. All mind operations appear to be capable of interacting with biological structures which are also necessarily physical in nature. My conclusion, therefore, is that consciousness and all its products operate using physical tools. In addition to this conclusion, I also defend two other points of view. The first point of view is that consciousness operates as a normal process of the mind independently of its peculiarity of being able to operate simultaneously also in the metaphysical world. The second point of view is that the human mind has the capacity (still unexplained) of operating simultaneously both within a third person ontology (which is responsible for the intentionality processes) and within a first person ontology (which is responsible for conscious processes). My conclusion, then, is that all mind products, independently from being the result of an ontology of first or third person, are always the result of chemical–physical operations as are all the other biological entities of the living world. The functions and products of the human mind have been operating, at the beginning of the human life, largely, under conditions of deterministic chaos, then moving gradually, depending on the properties of the environment, to the more complex problems such as those of culture, science, art, morality and social life. The nature of these functions and products of the neuronal networks are of great interest for two reasons. The first is that an evolution of a chaotic mind–brain system driven by intentional mechanisms is naturally much more flexible and rapid than one driven by deterministic mechanisms (operating on the basis of the principle of chance and necessity). The second is that a human evolution based on intentionality is much more creative due the much larger possibilities of choices. Popper (1934, 1969, 1972) introduced the new concept of World 3, the world of the human mind products—in addition to the concepts of World 1 (the physical world) and of World 2 (the world of the human mental states, including consciousness). World 3 includes: the human stories, the material instruments, the scientific problems and theories, the social institutions and the regulations of the human societies, the art products, the principles of morality, and all the other ideas, entities and contributions elaborated by the human mind during the world history. I have recently proposed (Azzone 2005) to replace the famous Cartesio statement (Cogito, ergo sum) with the statement: I think: then I can create the human world. In this statement, the human mind is considered responsible of everything existing in the present and in the future human world, inasmuch as it has been the human mind which has provided the creativity necessary for the generation of the actual world and will generate in the future the innovations of the natural and social world developments. About 1 year ago, a paper by A. R. Cashmore was published in PNAS (Cashmore 2010) in defence of a thesis which is opposite to the one defended in the present paper. According to A. R. Cashmore: “the laws of nature do not accommodate the concept of free will….it is common to stress that biological systems obey the laws of chemistry and physics; as living systems we are nothing more than a bag of chemicals….The irony here is that in reality, a belief in free-will is nothing less than a continuing belief in vitalism, a concept that we like to think we discarded well over 100 years ego!”. I agree with A. R. Cashmore that if living systems would be nothing more than a bag of chemicals then it would be impossible to explain free will. I think, however, that there are good arguments in favour of the view that the behaviours of human beings are much more complex and difficult to explain than are the behaviours generated by a bag of chemicals. As discussed in the present paper, several arguments have been provided against the view of the operations of the mind–brain system as produced by a bag of chemicals. Other arguments have been provided by the comparisons between human evolution and the evolution of the non-human species. In my view, it is a deep mistake to try to explain human evolution and human behaviour using only the information provided by the DNA-gene systems. As I have discussed previously (Azzone 2010a, b, c), there are fundamental reasons for defending the alternative thesis of the operation of dual and alternative mechanism of human evolution based on the DNA-gene dependent operations in the initial phase of development, and on the intentionality-dependent operations in a second phase. The point is that the intentionality-dependent evolutionary mechanisms of the human species produce effects whose nature and results appear as markedly different from the Cashmore’s descriptions of the DNA-gene-dependent mechanisms. Dennett (2003) has argued that if, in the present world, all the phenomena would always be fully obeying to deterministic principles, it would be impossible to have any form of free-will. If the human mind would always be operating under conditions of strict determinism, life and behaviour of human beings would proceed towards only one type of possible physical future. The whole life of all human beings would be completely predetermined and would be nothing else but an already written book. The question then arises: can the free-will behaviours of human beings take place in a completely deterministic world? Physicists defend the view that the indeterminism is certainly true at the subatomic level. But can this subatomic level indeterminism extend to macroscopic systems? Most physicists would not agree with this possibility. In order to address the problem of the non-deterministic behaviours in macroscopic systems such as human behaviour, let us now consider an alternative explanation for the mechanism of free-will. A somewhat slightly similar explanation has been recently discussed by Kane (1996) and by Dennett (2003). In my opinion, in order to explain how the human mind could generate the conditions of free-will, it may be useful to imagine a somewhat different interpretation of the processes and the interactions between neuronal and synaptic operations. In this new interpretation, the free-will types of behaviours of the mind–brain systems should always be favoured by the development of extensive series of synaptic interactions between neurons. The free-will decision would be favoured by multiple signals (due to series of multiple, although different, intentions) developed simultaneously during the interactions between different neuronal networks, and multiple selections within the gaps which have been developed in parallel with the behaviours created by the mind intentionality. (a) The first mechanism utilizes the information provided by DNA-genes for the generation of the various biochemical, physiological, structural components and functions of the human body. This first mechanism for the conversion of the information provided by DNA-genes lasts 9–18 months in the human species, whereas in most other species its duration is considerably shorter. (b) The second mechanism reflects the utilization of the mind’s intentionality following the development of the neuronal networks. This exclusively human mechanism can then be further divided into two sections. The first section generates all the operations required for the use of language and intentionality, leading to the mastery of both language and intentionality and determining all personal behaviours; this section lasts from 3 to 5 years. The second section develops the procedures of free-will and voluntary behaviour which are essential for the acquisition of culture, science, technology, art and morality. This section has an unpredictable duration because it depends on the properties of the environment in which each human being is living, and on the variety of the manual activities or of the high specializations of culture, science and art. In this section, a crucial problem is that of the differences in cultural background existing among the various areas and various social environments of human societies. Because of these deep differences only a great care in education, combined with proper political and cultural choices, can avoid the development of a multiplicity of barriers and social differences existing in the human societies. These barriers and social differences may be much deeper than those of a genetic nature and may lead to dramatic social and political conflicts.